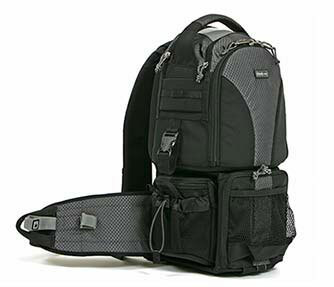 This is a back pack style camera bag with the unique feature of a separate waist bag which fits neatly in the lower part of the main back pack section and swivels around the body as needed for quick access to the contents. The bag is attractive and it seemed to be very well made. As I have been a product designer and manufacturer of a very successful professional line of products this was of particular interest to me and it passed the test of quality with one small reservation – the same one I mentioned on my previous review of the Speed Freak. The zip fasteners have cords, which I don’t object to, but they do have a tendency to come untied and could get lost. As a precaution I tightened mine up as they were loose when they arrived and they should be checked on a regular basis. This bag has so many innovative features that Think Tank has produced several excellent movies that explain how they all work, so bearing this in mind, I found the photocopied instructions did not come up to the same standards of professionalism that I expected. As this bag does really need to have the features explained so that the buyer can familiarise himself with these, a properly printed instruction manual should be provided with a product of this price range and quality. With forethought and a bit of time spent in customising the interior to suit individual requirements this versatile bag can be made to accomodate most people’s needs for an outdoor shoot. (Check out “The Woman’s Take” section of the review below.) 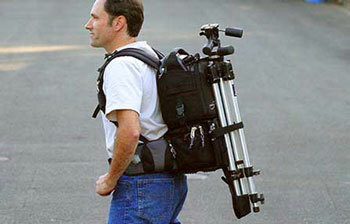 A tripod is easily carried in the pull-out cup that holds the legs and there are straps to attach it to the bag. The waist bag, which is where I would carry camera, lenses etc. could not accommodate a pro body or a body with grip with the lens pointing down, so my own kit was stowed sideways, where it fitted snugly. This way it will take the camera and grip with lens 24-105 or 16-35 if you remove all the dividers. If you have any other spare lenses you can attach them to the belt in other lens cases where they would be immediately to hand or in the pack area which would make them less accessible. If you were travelling with the camera out of the bag, the bag would be large enough to easily hold the 70-200 zoom or the 2 lenses above, with plenty of spare room. I would have liked to see it large enough to hold at least a pro body with lens downward. 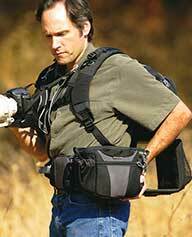 It does work really well if you are wearing the camera hanging from the bag around your neck, when you can then keep a couple of lenses in the waist bag itself, but this is not always practical or desirable. There are plenty of removable dividers in the backpack which makes it very customisable. 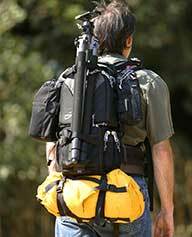 Being able to use this bag with additional lens carriers and other modules on the rails on the waist band and on the bag itself makes this highly versatile and extremely useful. I used it with the Think Tank Whip It Out which I have found to be absolutely indispensable in my work. I felt that the fastener on the waist strap is too far to the right making it difficult to attach and detach. You have to rely on feel more than vision, which is not ideal. The strap that fastens around the waist is really long. I have a large frame and found this to be the case. Even someone who is carrying considerably more weight than I am would most likely still find that the strap would have a lot of excess that needs to be stowed somewhere. The solution for stowing the excess strap according to the instruction leaflet is really not the answer, as there are still too many dangly bits to get in the way and cause annoyance. The manufacturers have made the point that this bag is a “one size fits all” (see The Woman’s Take for more on this) and that the excess can be cut off and the ends sealed with a match. I would suggest testing this first with the heaviest clothing that you are likely to wear before cutting the strap to length. In the situation where you are sharing this bag with a person of a different build, the same caution applies. This seems a reasonable solution and would certainly reduce or remove this annoyance. The waist pouch is easily released and locked by a simple pull tab which operates two velcro patches located inside the backpack housing. When released the bag can be rotated fully around the body in either direction by simply pulling on the grab loops on the waist belt. Returning it to its housing is easily achieved in the same fashion. I found the lock/unlock mechanism easy to use and with a little practice was able to quickly rotate the waist pack to the front to gain access to its contents. Re-locking was as easy as pulling on the lock tab, which re-engages the velcro. When carrying the bag in a purely transportation mode, there are secondary locks that will hold the waist pack even more securely in position. There is a small additional pouch on the waist belt which is very useful for carrying any number of small articles such as car keys, flash cards, spare batteries – I carried a small pair of Leica binoculars in mine. 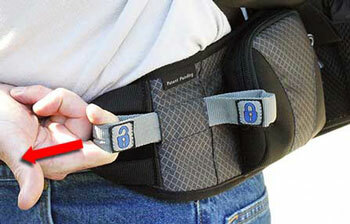 The front shoulder straps have elasticated pouches that would be perfect for a cell/mobile phone,or the like. 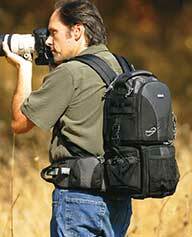 The two shoulder straps incorporate two dog lead style clips for attaching the supplied camera strap. 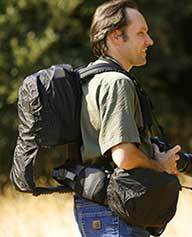 This replaces your regular camera strap preventing neck strain by distributing camera weight to the shoulder straps. This is a superb feature of this bag that I very much appreciated. The camera is suspended from the straps and is readily accessible. You could attach a camera to each strap if you were using two, with the purchase of an additional strap. The 360° belt pack can be used as a standalone bag, strapped to your waist, with or without the supplied shoulder strap, which would help to distribute the weight more evenly when it is used in this fashion. It has its own seam-sealed raincover as does the back pack itself. There is a special strap supplied that allows for additional items, such as a stuff sack filled with clothing etc. to be attached to the bottom of the bag. I wore the Rotation 360° for a period of several hours, trecking through deep snow in the woods, found it to be very comfortable and was almost unaware of its presence. As I have said on the previous review of the Think Tank Speed Freak and as is the case with most of their products, the focus seems to be not only on great protection for your gear, but on fast accessibility, which can only result in fewer lost shots and the opportunity to get more great ones! This bag certainly fits that bill. It is not easy to find a backpack style camera bag that is comfortable for a slightly built woman to wear, but this bag was a pleasant surprise. I thought that it would be helpful to give my take on this bag from a woman’s point of view, so I set off on a short 3 mile hike wearing the Rotation 360°. I packed a camera body (D20) and 24-105 f4L IS lens with grip and spare batteries, the 70-200 2.8L IS lens and the 16-35 2.8L IS lens as well. The whole thing was a good weight to lift into place and a good test of carrying this amount of gear in this bag. It was by no means full and I would have had room for a flash gun, other lenses, sandwiches, bottle of water or other small accessories. The usual problem that I encounter is that the shoulder straps are too widely placed and constantly give the impression that they are falling off one shoulder or the other. They also can seem to be too wide, taking up most of the shoulder space and possibly rubbing the neck. Another problem is the position of the backpack itself, often resting the load too low in the lumbar region and can cause an uncomfortable rubbing while I walk. Neither of these were a problem with this bag. My first impressions, when I was adjusting it to fit me were of too many long strap ends hanging about everywhere with no apparent stowage places. This is particularly noticeable for a slim person as all of the adjustments were taken up almost to the maximum. The solution above about cutting the strap to length would get over this problem. Once all the straps were pulled up to almost their smallest, the pack did fit me snugly. Although I initially noticed that the shoulder straps had some gaping spots on the back of the shoulders this was not at all uncomfortable, nor was I aware of them once I started off. The shoulder straps were possibly a bit wide but were so well padded that this caused no problems, as they did not touch my neck area nor restrict my movements particularly. In fact this shoulder strap width and padding seemed to spread the weight well. Once the shoulder straps were pulled up to the absolute maximum, the backpack was sitting fairly high and off the lower lumbar region, so that I felt quite comfortable walking with it on and felt there to be good weight distribution with no rubbing. Although I did this hike in the winter and therefore wore a thick winter jacket, I tried the bag indoors with a tee-shirt and the fit was equally good. The belt too was a good fit once pulled all the way up, and also helped spread the weight. I found no difficulty in releasing the lock to swivel the waist bag to the front and then locking it back into position. The waist belt fastening was a bit difficult to reach but no more so for me than for someone of a bigger build. There is a chest strap that helps to hold the pack in position and I was concerned that this could be uncomfortable for women of different builds. The chest strap is easily adjusted for length, but also for the height, so that it can be positioned on the lower or upper chest for personal comfort. I was quite happy carrying this gear in the Rotation 360° for that short hike and would say that for a person of a slight build that it seems to be a comfortable enough bag, fitting the bill of a back-pack type of camera bag. I found the design really innovative and the ability to access frequently used bits of gear very easily puts this bag out in front of the rest. This is a very well made piece of kit. I can’t fault the quality of manufacture, except for the issue with the zip fasteners. The designers of this bag should be congratulated. Their award from ‘Professional Photographer’ – HOT ONE AWARD – as BEST NEW CAMERA BAG was well deserved. They have successfully created a bag that is not just packed with features, but with features that are extremely relevant to the outdoor photographer. It is extremely cusomisable and I’m sure that every user will make it their own. Although the price tag on this might seem a bit high at first glance, the versatility, quality and the sophistication of this system makes it very good value for money in my view. It’s one heck of a bag! For more information check out the manufacturer’s site. I don’t mind to have if the price is right. Thank you for including a review by a woman… we’re not all 5’10” and being vertically challenged usually means that our shoulders are narrower and our backs are shorter. It was very nice to get another perspective.